This entry was posted in food, rant and tagged deception, fakes, food, rant. Bookmark the permalink. wow. i totally agree with everything you’ve said in this post, as well as the spirit in which you said it. not only the “fakeness” of it but the sheer waste…more of their damn plastic into the earth, sea, landfill, planet. aaaggghhh. eating out used to be fun. now it’s a land mine of waste, chemicals and torture for the animals. can you tell i’m a little quick and grumpy today? my trip to the gro/pharmacy was spent filling an rx (necessary) for heart situation that cost me $80 and has now had terrible adverse reactions. can’t use it. $80 gone. 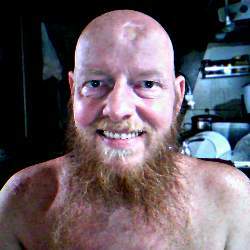 (on the high side, after being vegan for 7 months…have lost 10 lbs … 15 more to go and was told i no longer need the open heart surgery they were planning… yayyyy!) so i guess i should shut up and go make my grocery list. real honey will be on it. cheers! That’s true too, Tammy. Fast food generates way too much plastic trash. Some places have pump dispensers for condiments which helps a bit for eat-in customers. Yep, the price of medications is enough to justify its own rant, isn’t it? That will be nice once you get things under control and get off the meds… save money and no more side effects. Fortunately, I don’t really like honey — although the jar in my cabinet is real. What’s worse is that those biscuits (which are quite tasty) are already slathered in oils and stuff after they’re cooked, so they’re already “dressed”. I eat fast food, too, but I do limit portion sizes much more than I used to. That at least limits the chemicals, I suppose. Wow, Gip, you’re right about those biscuits. I just found KFC’s ingredient list. Incredible. In fact, the only item on their menu that is exactly what it says is “corn”. Every other item has dozens of ingredients. Scary. I don’t eat at KFC (vegetarian) but the few times I’ve had to go in, the only thing I’ve ordered is corn. Funny that it’s the only “real” thing they’ve got! I was in Publix the other day ordering a sub (I love their sandwiches) and I spotted a tub behind the counter that said something like, “Vegetably oil.” I took one look at it and realized they couldn’t call it vegetable oil because that’s not what it was…. so they worked around it by calling it vegetably. Sneaky! But, my veggie sub from them doesn’t have any “vegetably oil” put on it, so I’m safe…as long as the olive oil isn’t really olivey oil! The spooky thing is, I think the “chocolatey chip cookies” were actual chocolate back when I was a kid. The word “chocolatey” back then meant more along the lines of “filled with chocolate” or “rich chocolate flavor”, not “we can’t call this chocolate, so we’ll call it ‘chocolatey'”. 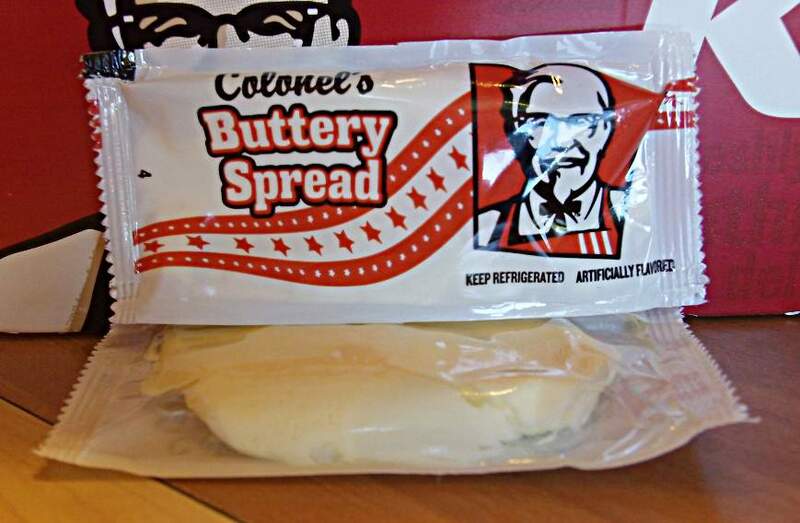 “Buttery spread” I can believe – lots of people don’t even expect real butter at restaurants anymore, and still more think it’s not particularly healthy for you. 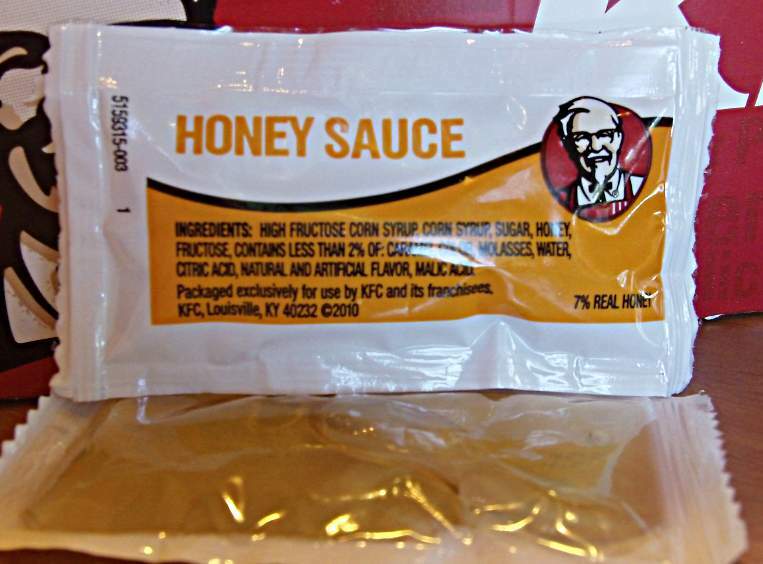 But “honey sauce”? There are times when I wish they’d just say “we have honey, but it’s gotten more expensive so we can’t just give it away. We’ll sell you a packet for a dime”. I’d cheerfully pay the dime. 🙂 Either that, or just put packets of corn syrup on the counter, and label them as such. I’m still trying to come up with what would be in a vegetable oil that would necessitate calling it “vegetabley”. If my foodie brain had to guess, I’d say real oil + water + some sort of emulsifier that keeps the water and oil from separating. Or if it was used for deep frying, vegetable oil + some sort of animal fat. You just can’t do frying properly without a pretty much pure fat. Great post (and comments so far)! Scary how every fast food place has replaced food items to make it as profitable as possible. Hi Marc, and welcome. It does seem to be a trend, doesn’t it? And you are probably right that profit is the motive, as it seems that if it isn’t offering a cheaper substitute for a real item (or substituting cheap ingredients for expensive ones) it’s loading things up with preservatives to extend shelf life.